New Year’s Day, in any culture with a calendar, is a fairly obvious holiday. And so perhaps it follows that it is the oldest holiday celebrated in the United States. Approximately 2,750 years ago the earliest Romans had, according to legend, a singularly hedonistic emperor named Titus Tatius. It was either he (if he existed) or someone else at the time who declared that the first day of the year should be a holiday, with gift-giving. 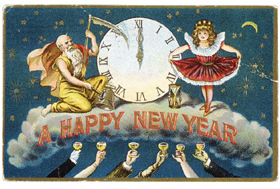 If New Year’s Day is an old holiday, then one might reason that New Year’s Eve is necessarily even older—by at least one second—but in fact, very little celebrating was done on New Year’s Eve until after the sixth century, when the Christians co-opted gift-giving as part of Christmas. That left New Year’s, both day and eve, without any particular motif. New Year’s Day soon developed into a time for visiting friends, and especially for patching old feuds. That still left a great many people with nothing in particular to do on New Year’s Eve. Then came the wassail bowl. Popularized by the Saxons in the Middle Ages, the wassail bowl was the first cocktail shaker, inasmuch as it called for a recipe of alcoholic beverages, mixed all together and dispensed on the spot. The wassail bowl started the party rolling for all time. Every time someone shouted “Good health!”—“Waes hael!” in old English—the guests dipped their cups in the bowl and drank to the bottom. Wassail was a strong concoction, so those assembled could not hope to remain sober. Fortunately, no one wanted to. Not on that night. Legend has it that if a large vessel, such as a two-handled loving cup, was filled from the wassail bowl, tradition called for a piece of hardtack to be placed in the bottom before the cup was passed around. Once everyone had taken a gulp, the cup returned to the host, who had the honor of eating the soggy toast. That New Year’s Eve tradition gave rise to the custom of drinking a “toast” to someone, by way of an honor. For those who didn’t want to get drunk on New Year’s Eve, there were other ways to escape the specter of time flying by. They could face it down by throwing shoes around or peeling apples. Most of the superstitions associated with New Year’s Eve were designed to give a hint as to whom one was destined to marry. They were especially popular among Germans, who brought them along when they moved to America. If a young woman wanted to know whether she was going to be married in the coming year, she sat on the floor with her back to the front door and, exactly at midnight, flipped her shoe from her foot over her head toward the door. If it ended up facing the door, she was going to be a bride. If a man or a woman peeled an apple in one long curving skin and then flipped the skin to the floor exactly at midnight, the shape would indicate the first letter of the first name of his or her future spouse. Such New Year’s Eve superstitions were not kid stuff. They were often taken with absolute seriousness. According to one, an unmarried person could walk into an otherwise dark room at midnight, place two candles on a table in front of a mirror, and then stare into the mirror. After a full hour, the face of their future spouse would appear in the mirror. That particular New Year’s superstition should come with a warning, however: Do not try it at home. It is claimed that sometimes people actually died while staring into the mirror. In the late 1800s gas and electric lights helped lift the basic pall of New Year’s Eve. Residents were supposed to turn on all of the lights in the house. Noise also came into vogue then. At first people were drawn out into the streets simply to hear church bells at midnight. In fact, that was the origin of the expression, “Ring out the old year and ring in the new.” The prettiest peals brought the largest crowds. That was a point of pride, especially for big-city churches. Then, in a further evolution of the holiday, some of those in the crowds were inspired to bring their own hand bells and noisemakers. Then people skipped the church and stood in any street, blowing a horn or banging a drum. Finally no one could hear the church bells for all the rest of the din at midnight. A little while after that, the people who had looked forward to the church bells began to stay home, disgruntled. And pretty soon, most of the churches stopped ringing their bells. More and more, New Year’s Eve was left to the extroverts. In Manhattan, during the early years of the 1900s, the favored places to congregate on New Year’s Eve were City Hall Park downtown, Harlem uptown, and Times Square in Midtown. In 1908, though, the New York Times made its namesake square the epicenter of the New Year’s Eve holiday by installing a steel-framed tower just for the purpose of dropping an electrically lit ”Great Ball” from the top, at the stroke of midnight. That ball now helps to draw three-quarters of a million people to Times Square on New Year’s Eve. The image of the silvery ball falling in the midnight sky has come to be regarded as a something akin to a natural occurrence, like the Northern Lights. Undeniably it gives a meaning to the holiday. For one group of people it is a sign of bedtime. For the other it represents the start of the serious reveling. Each group, needless to say, is entirely disgusted by the other.